Along with drone technology and the advancement of user-modified drones, another thing that has also been evolving is LED technology and the way people use it. In this four-minute video, you will see a good example of the combination of these two technologies, as Stratus Productions mounted a 1000-watt LED light to a Freefly Systems Alta 8 drone. The story of building the 1000-watt LED bar started last year, and in this video, it is attached to a drone for its first flight. As it's told in the video, with some battery modification, both the drone and the LED bar can run for about ten minutes. Taking the required power into consideration, ten minutes of running time sounds miraculous. In addition to lighting aerial videos at night, this experimental system (or builds similar to this system) can also be used for a variety of other purposes, from lighting subjects at any time of the day when shooting from the ground to aiding in search and rescue activities. If you have any LED-based custom-modification experience with drones, please share it with us in the comments below. For some gorgeous sample footage shot with this rig, skip straight to the two-minute mark in the video. NTT DOCOMO, INC., in a continuing quest to create innovative new business, has developed a spherical drone display - an unmanned aerial vehicle that displays LED images on an omnidirectional spherical screen while in flight - which DOCOMO believes to be a world first (as of April 16, 2017). 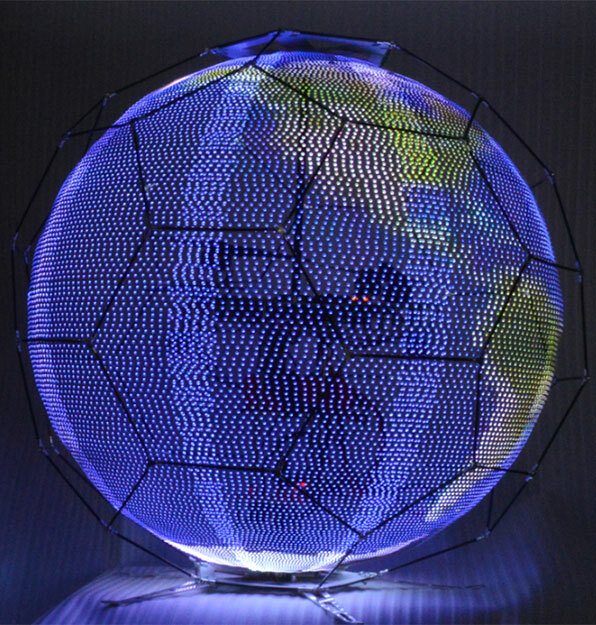 The device comprises a spherical external frame, an internal LED frame consisting of a series of eight curved LED strips that extend from top to bottom, a drone fitted inside the sphere and legs protruding underneath. 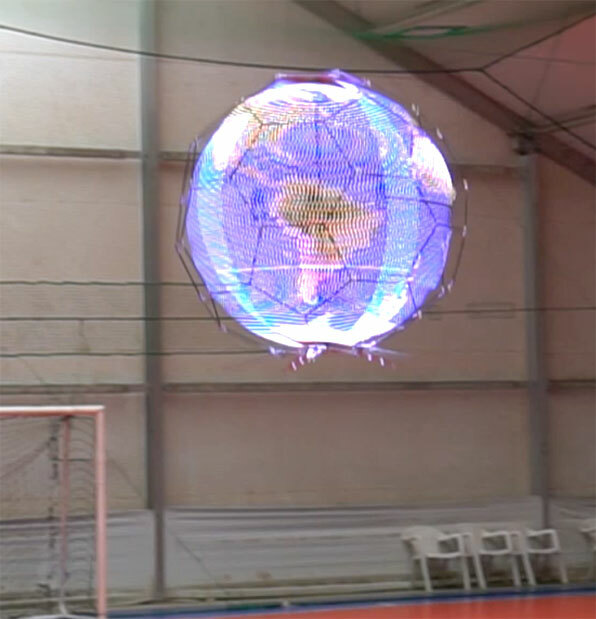 During flight, the LED frame spins on its axis in a rapid horizontal motion, forming an afterimage effect to create the illusion of a solid sphere of motionless LEDs. The highly maneuverable drone can be operated virtually anywhere, including venues such as concert halls or arenas where it can fly around as part of a performance or deliver advertising messages, event information, etc. Equipping a drone with a spherical display had proved difficult until now due to challenges such as the display interfering with the airflow of the drone's propellers as well as the added weight of the display. However, DOCOMO's solution uses a largely hollow display that is exceptionally lightweight and allows air to flow through it, yet it still achieves the illusion of a solid display by creating an afterimage effect with rapidly spinning LEDs. DOCOMO aims to commercialize its spherical drone display in the fiscal year ending in March 2019. Going forward, the company will explore potential entertainment and messaging solutions for event venues, including stadiums and concert halls. 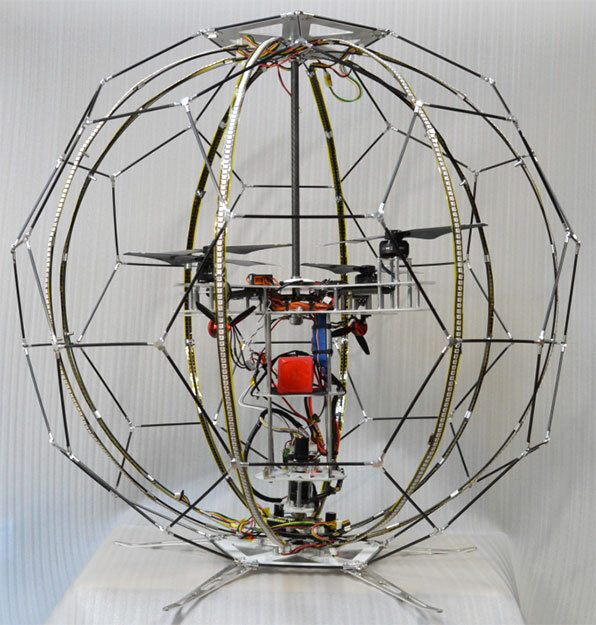 DOCOMO will showcase its spherical drone display at NTT ULTRA FUTURE MUSEUM 2017 during the Niconico Chokaigi conference at Makuhari Messe, which will begin on Saturday, April 29. The exhibition will include a flight demonstration inside the event hall. Under the "docomo Drone Project," DOCOMO is exploring ways to combine aerial mobility and communications mobility in innovative solutions for logistics, messaging, entertainment and other fields.